Street and working children during a photography workshop hosted by famed photographer Vicky Roy in conjunction with the Child and Adolescent Rights Conference in Delhi. (July 25, 2013) — In the last 20 years, India has made impressive strides toward improving legal, policy, and administrative frameworks aimed at protecting and promoting child and adolescent rights. Significant challenges remain, however, as total government expenditure on child protection remains at only .034% and approximately 170 million children and adolescents continue to live in difficult circumstances. To evaluate and address the urgent challenges facing children and adolescents in India today, the FXB Center for Health and Human Rights at Harvard University, in conjunction with the Public Health Foundation of India’s education arm, the Indian Institute of Public Health, Delhi, organized the “Children and Adolescents in India – A Critical Rights Agenda” conference based on pilot studies undertaken at construction sites in Delhi and railway stations in Jaipur. The findings came from tools developed based on the ‘SAFE Model,’ a rights-based, holistic framework for examining fundamental and interrelated domains of child and adolescent rights and security developed by Theresa Betancourt, Director of the Research Program on Children and Global Adversity at the FXB Center. PHFI and the FXB Center jointly developed the SAFE checklist, an application of the SAFE framework to assess core indicators of children’s core security needs in a variety of contexts. This checklist and the SAFE Child Impact assessment (modeled after environmental impact statements mandated in infrastructure development projects) were piloted in research on child protection issues in the Jaipur railway station and several infrastructure development sites around NCR. Recent developments in the field of child and adolescent rights with a particular focus on the jointly developed FXB Center’s SAFE model. The SAFE model is a rights-based, holistic framework for examining four fundamental and interrelated domains of children’s security including: Safety/protection, Access to health care and basic physiological needs, Family/connection to others, and Education/economic security. The SAFE framework is rooted in the UN Convention on the Rights of the Child and recognizes that these core elements of children’s basic security are interrelated and interdependent. Discussion also focused on the importance of the agency of children, youth and families and the risky and adaptive survival strategies employed by children and families living in adversity the Jaipur Railway Station and migrant workers who live with their children at construction sites. Colleagues also presented findings from a positive deviance study investigating how Indian female college students from marginalized backgrounds managed to successfully overcome economic, social and cultural barriers and gain access to a college education in Maharashtra. Major and systematic challenges to the application of government policies, especially those challenges that the Integrated Child Protection Scheme (ICPS) has faced in addressing the needs of abused, neglected, exploited, abandoned, and/or separated children. A critical overview of root causes contributing to unmet needs, focusing on the feasibility of strengthening community based mechanisms for protection that will address structural determinants of vulnerability was further discussed. Panelists also highlighted innovative ideas that have successfully advanced the child rights agenda, bringing forth thoughtful illustrations of resilience and empowerment so that successful examples of effective initiatives can be shared across sectors and scaled to reach larger populations of children and adolescents. Scalable best practices in policy and advocacy that can be leveraged into sustainable initiatives across multiple sectors, with special attention to adolescence and to the urgency of developing an adolescent rights agenda in India were also discussed. Discussions revolved around moving forward on issues critical to adolescents such as addressing the stubborn persistence of high rates of child marriage despite legislative prohibition, pervasive youth participation in and subjection to violence, disproportionate rates of female illiteracy and educational exclusion, and adolescent anger and despair over lack of jobs. Emphasis was made to policy and advocacy best practices with the goal of advancing the adolescent rights agenda. The conference brought together a range of key stakeholders, including representatives from the government and leading civil society and intergovernmental organizations such as UNICEF, Save the Children, Mobile Creches, Population Foundation of India, The National Commission for the Protection of Child Rights, and the India Alliance for Child Rights. In conjunction with the conference, famed photographer Vicky Roy hosted a photography workshop for street and working children between seven and 18 years old. 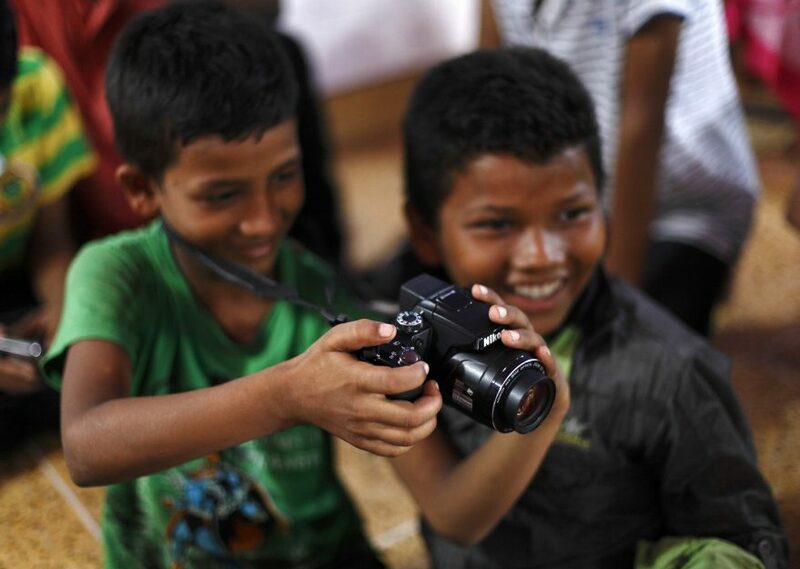 After a brief training session, the children fanned out across Old Delhi to capture the city with their cameras. Select photographs were then printed and displayed in an exhibit at the conference.